The parish church of Ulmet ranks among the oldest churches in the middle Glan valley region. For centuries it carried the name “Flurskapelle” which translates to Field Chapel. Some churches in this region of Germany were built apart from the village and served as parish churches to several villages. In the year 1124 in a document from the monastery Remigiusberg, the Flurskapelle was mentioned for the first time as “Capella”. The record no. 89 of the monastery Werschweiler called this place of worship “field chapels”. In the 14th century the name “Florus Cappeln” appeared. It was the chapel of Saint Florus, per Dr. Ernest Christmann. The construction of the “Flurskapelle” reaches to the end of the 11th century. The oldest church carries the year 1091, which is probably to regarded as the year it was built. Only the early Roman stile tower of that church survives today. This four story tower tapers upwards and has for span ceilings. The three lower levels show slotted holes, which can be labeled as a significant characteristic of the 11th century. Instead of the slotted holes, the top level has four double windows with round columns. An octagon shaped vaulted roof covers the 27 meter high tower. Another significant characteristic is located at the west side of the tower, an 80 cm large head has been built in the stonework. This stone head was probably used as a corbel, which could be used for the support of stone and timber constructions, the admission of crane loads, or as a platform for a statue. The nave of the first church wasn’t built as storng and stable as the tower and therefore had to be replaced by a new one in the year 1299. In 1540 when the count of the palatine (Pflazgraf) Ruprecht had the guardianship from 1532-1544 over his nephew Wolfgang (1526-1569) the parish had to build and maintain the tower and one half of the nave while the church authority was responsible for the other half of the nave and the parsonage. There was a circular wall which surrounded the cemetery and formed a unity with the church. During “restless times” this unity gave some cover to its distressed inhabitants. The record of visitation of the year 1609 talks about a parish “Flurs-Cappeln”. The pastor, mayor and two church servants lived next to the church. The Thirty Years War didn’t spare the house of worship. On the grounds near the field chapel, Rhine Count Otto Ludwig on May 25, 1632 defeated the Spaniards with a crushing victory. During the battle, the church and cemetery were affected because in those times, not much respect was given towards places of worship. 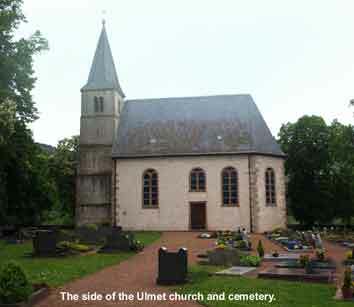 Three years after the battle imperial troops plundered and burned the village of Ulmet including the parsonage. The church however seems to have escaped the plundering. Only the windows were destroyed, so that over time the weather would cause damage to the interior. In a report to the administrative authority of the protestant church in Zweibruecken, the structural conditions of the church were labeled intolerable. The gabled roof was about to collapse, church gallery was so dark no one could read the hymn-book. Finally, because of increasing number of inhabitants the house of worship was too small. They decided to keep the original tower but the rest of the church needed to be constructed. Finally on July 1, 1737 at noon the foundation stone for the new church, which still is standing today, was put in place. 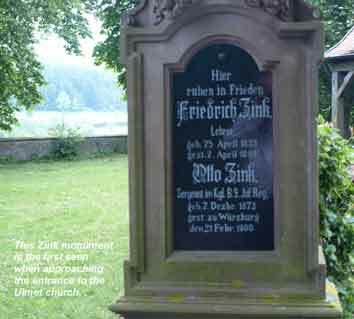 Surnames associated with this church and village include: Drum/Drumm, Hertel, Grill, Zink (see picture), Graf, Grub, Hamm, Heidrich, Hirsch, Biehl, Cappel, Cabe, Klinck, Licht, Metz, Schussler, Fischer, Germann, Mohr, Parr, Simon, Schramm, Spielmann, Tosch, Theobald, Thomas, Wilms. Our thanks for Betty Griffin for this contribution to the ancestral church project. 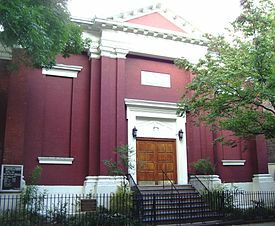 St. Mark’s was a German speaking Lutheran congregations in New York City. St. Marcus’ was located on the Lower East Side in Manhattan, where German immigrants had founded it in 1846 to have a home for their faith. The congregations grew at a rapid pace with the influx of mass immigration to the United States from Germany in the end of the 19th and the beginning of the 20th centuries. In 1904 disaster struck St. Mark’s from which it never really would recover. The Ladies’ Aid Society (Frauenhilfsverein) had chartered a boat for its annual outing, the General Slocum. Almost all the women and children of the parishioners went aboard that steamship to sail up the East River for a wonderful summer day outing. Around hell’s gate, the boat caught fire and over 1000 parishioners perished. In 1946 then St. Marcus’ merged with Zion after most of the remaining congregation had left the Lower East Side and moved to Yorkville. This is the ancestral church of the Herrmann-Dritschel family great grandparents of Carol Swinehart. Barbara/Babette Dritschel/Drutschel, (immigrated age 2 in 1850 from Altdorf bei Nurenberg, Bavaria), married George Herrmann, (immigrated ca 1859), in 1866. Most of their children were baptized in this church.